With soaring gas prices equating to low, low, low SUV sales, Ford seem to have released the brand new Flex at just the right time. The 2009 Flex – which designer J Mays has referred to as a station wagon – presents an intriguing answer to the question: “How am I going to haul the family around now?â€ The Flex excels at moving large amounts of people and all their assorted sundry items from place to place. Inside is a well-built interior featuring clean gauges, easy to operate controls and third-row seats that fold flat with a flip of the wrist. Under the hood is a plenty potent V-6 and an impossibly smooth all new six-speed automatic transmission. With an exterior styling that’s anything but ordinary, the Flex offers a good-looking, fun-to-drive vehicle that serves up an amazing 24 mpg highway in two-wheel drive guise. With alternatives like this on the road, we think it’s safe to say that the reign of the SUV is coming to an end. The Flex’s cavernous, well-finished and upscale interior is fantastic. With three rows of seating that include a pass-through second row with an auto-fold function and comfy rear seats swaddled in optional supple leather, this crossover can handle any long journey thrown its way. The driver’s seat provides a clear view of the road with few blind spots. Also, the new Sirius Travel Link navigation system is a revelation. While there are several interior color options available, the white leather tends to show dirt quickly, as in before it leaves the dealer’s lot. While the interior is mostly comfortable, the front and rear headrests can be awkward. Projector headlights are only available in upmodel SEL and Limited trim. The Flex is a pleasure to drive on almost every level. The engine responds with more than enough power to move the sizeable vehicle along, and Ford’s 6-speed automatic transmission shifts smoother than the auto mounted in BMW’s new 1-series -- something that we would have though impossible just a few years ago. While the Flex stretches to just shy of 202 inches long, it’s remarkably maneuverable in parking lots and tight spaces, and the fantastic visibility makes spotting obstacles easy. Ford’s limo-like ride is powered by the company’s new all-aluminum 3.5-liter Duratech V-6 engine, longitudinally mounted. Providing 262 horsepower and 248 lb-ft of torque, it still goes easy on fuel; this power plant is sure to be a favorite of Ford’s for years to come. A flawless 6-speed automatic transmission directs power to either the front or all four wheels. With a focus on ease of ingress, the Flex comes with second row seats that flip flat with the push of a button, allowing easy access to the third row. A simple pull of a tether is all it takes to put them upright once more. The optional $760 dollar refrigerator blows cooler than a McMansion’s Sub-Zero. Also, the $1,495 dollar Multi-Panel Vista Roof brings in enough sunlight to work on your summertime tan and brightens up the interior considerably. The Flex is available with Microsoft’s SYNC technology, which allows you to command navigation, the sound system, and make hands free phone calls all by voice. That allows you to keep your eyes on the road and your hands on the wheel. DVD entertainment is available for rear passengers, and an optional rearview camera is also available. What we like most is the new SIRIUS Travel Link navigation system with its cheapest gas and – YES! – sports scores on demand. 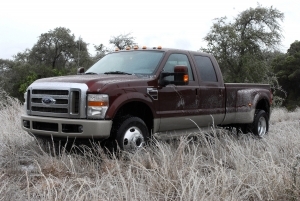 The all-aluminum V-6 delivers remarkable fuel economy for a vehicle this size. The ULEV-II rated Flex gets 17 mpg city and 24 mpg highway when equipped with front-wheel drive only. The heavy all-wheel drive system drags economy down to 16 mpg city and 22 mpg highway. Inside, this vehicle provides the driver and co-pilot with a high command position. The dash fit and finish is unlike anything we’ve seen from Ford in the past, with quilted leather reminiscent of a Chanel handbag and, in base models, Brooks Brothers preppie-inspired cloth seats. The back rows offer wiggle room for full-grown adults, and the dual-zone climate control (standard on SEL and Limited trims) keeps everyone cool as a cucumber. Outside, the Flex benefits from truly unique styling. There is no mistaking this vehicle for anything but what it is, a modern rendition of the classic American station wagon. The contrasting color roof adds a certain level of flair, and side striations in the door skins add rigidity and create an interesting contrast of lines. Ford has entered into somewhat untested waters with the Flex. Since it’s a full-size crossover capable of seating up to seven and priced at $28,295 in base SE trim, the Flex squares off with the likes of the $30,050 Mazda CX-9 and trounces the $26,330 Nissan Murano. The SEL model comes in at $32,070 and the Limited at $34,705. All-wheel drive is an option too. There is plenty of competition on the horizon, however, with Chevrolet’s Traverse and Toyota’s Venza expected by next year. We think though, it’s in a class of its own. Ford may have finally answered the demands of families all over the country with the Flex. It’s a sharp looking, solid driving, easy on the gas people hauler, and while its base price is steeper than we’d like, you aren’t going to find a better option out there for the money. The Flex is a harbinger of good news: an era of innovative design geared toward solving problems instead of creating them may have finally returned to the domestic auto manufacturing landscape. We don’t usually herald a new next-gen navigation system as the end-all, be-all, but with the new SIRIUS Travel Link system, Ford is adding a whole new chapter to the book on automotive navigation systems with the release of their latest hard drive-based GPS system. 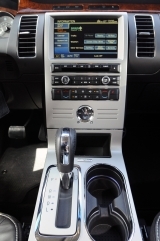 Ford teamed up with SIRIUS to offer their new Travel Link in combination with the SYNC voice activation system. What we like: never before have we been able to search traffic in multiple locations, find the cheapest gas in the immediate area or check movie listings simply by running through a few voice commands or using the touch screen if you’re into the instant gratification aspect of it. SYNC bypasses awkward strings of commands by recognizing more common phrases. “I’m hungryâ€ yields an instant list of the closest restaurants to your location. From there, you can parse them down by type or scroll through them alphabetically or by distance. “I need gasâ€ populates the screen with a list of the nearest gas stations, which you can then sort by the price of fuel. We’re no mathematicians, but driving an extra mile to that cheaper gas station you didn’t know existed has to save you money in the long run. Restaurant locations and gas prices are just a few tricks up Sirius Travel Link’s sleeves. The latest sports scores are at your fingertips. Realtime weather and even ski reports are available. If your airbags deploy, the system will automatically call 911 with your linked cell phone. Itching to get the system already? 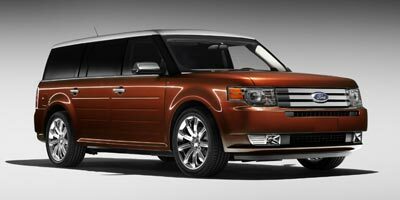 In addition to appearing in the 2009 Ford Flex, it’s rolling out in the 2009 Lincoln MKS as well. Suddenly those cars seem infinitely more desirable.